0) Isha and Fajr prayer in congregation (jama’ah). I put this as number 0 because if nothing else, this is the one thing a person HAS to do: pray Isha and Fajr in congregation. This is the baseline. Everything else after doing this is a bonus insha Allah. Aisha [RA], when asking the Prophet about Laylatul Qadar, said, “What dua should I make if I were to find Laylatul Qadr?”. Her question tells us that in her mind, her task was clear: make lots of dua. So she particularly asked for which dua to make to get the maximum benefit out of this night. Recommendation: get a book like the Fortress of the Muslim or ibn Taymiyyah’s Good Words then try to read as many (or all) of these duas. It is so spiritually uplifting. If a person can catch Laylatul Qadr and give charity on that night, that would have more goodness than a 1000 months of charity. Imagine that! A pro tip: give $20 in charity every night, this way you’re sure to have given charity on Laylatul Qadr. Read as much Qur’an as possible. Try to memorize a few ayaat to gain a tangible benefit (perhaps first 10 or last 10 of Surah Kahf). If you don’t understand what you’re reading, then mix in some tafsir. But don’t spend the entire night listening to tafsir, keep a fair balance insha Allah. The key is to mix to all these deeds. Start off the night with Isha in congregation and some charity. Proceed to read some Qur’an. Once warmed up, try to memorize a few ayaat. Then take a break with listening to a tafsir. Make dua afterwards and start night prayers. End the night with lots of dua, a nice healthy suhoor (or sehri) and Fajr in congregation. May Allah make us extract the maximum benefit during this night, ameen. The Prophet صلى الله عليه وسلم described suhoor as the blessed meal. Its something that Allah has especially given to us, so we should not leave it even if it means having a sip of water as suhoor. Its so special that the Prophet described it from the morals of prophethood. Ramadan With Quran: an intense, daily study of the Quran consisting of translation and recital. Starting July 15th,2012. This Ramadan, take a journey through the Qur’an, every day. Journey Through the Qur’an – Daur-e-Qur’an, is a quick skim-through of the translation of the Qur’an. One juz (or 1/30th) of the Qur’an is covered daily, enabling the class to finish the translation of the Qur’an within the month of Ramadan. The class is a must-attend for all Muslims so that they can spend their Ramadan with the Qur’an, trying to understand its meaning. 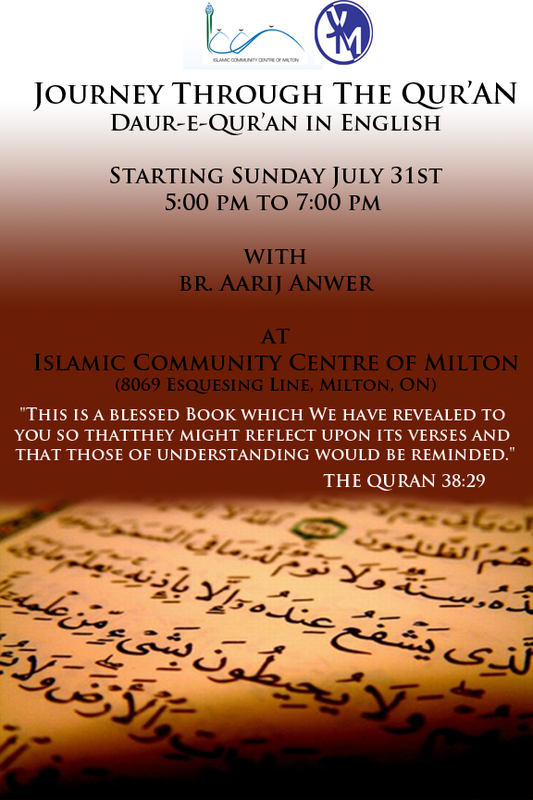 5:00 pm to 7:00 pm online and in-person at the Islamic Community Center of Milton.